Re-reading Franck Biancheri’s anticipations helps to understand the springs of failure and to build the next Europe from the lessons learned and on a much better understood foundation. This text is certainly a rough draft, but it gives a fairly precise idea of Franck Biancheri’s European genius, this great man of Europe’s history whom the Europeans must imperatively discover to nurture their rising Euro-citizen consciousness. Writing the preface to this book, “Community or Empire”, is a tremendous challenge. Ever since 1992, when Franck Biancheri put it on paper, one could almost imagine that time somehow stopped, or that the Europe of the last years has driven backwards. From the sub-prime crisis in 2006 to the war in Syria today, passing through a Ukrainian crisis, Europe seems to have made a choice, which is neither innovative nor democratic; a choice which has definitely lacked anticipation in all of the social, economic, financial, political and international fields. Franck Biancheri, who after being very ill for a long time, died in October 2012 at the age of 51. He was undoubtedly one of the most honest people in the European political world that I knew personally; one who was outspoken in his political speeches and his intellectual approaches. We certainly could never blame him for using stale language. And this book is one of many examples. All those having enabled him to survey the corridors, lobbies and cabinets of all decision-making levels in Europe. He therefore knew at what level one needed to look for responsibilities of the system’s drifts and he used to address directly those whom he considered to bear the failures, but also the successes of the European project. Being always extremely pedagogical, he used to bring ideas, to describe the tools and processes, to consider scenarios and bring solutions to policy makers. All they had to do was to help themselves… He was extremely modern, even more than that, he was innovative. He invited us to go beyond the copy/paste systems (the United States/ the House of Europe) and to invent what tomorrow’s democracy would be in Europe, by initiating the citizen debate (with the youth mostly), at intellectual, political levels by applying the resources given to us by modern technologies (he was undoubtedly one of the pioneers of the Internet by imposing in 1988 the use of the Internet’s ancestor, the Minitel, as a tool for the European political campaign IDE, and he was always convinced that we would eventually find the simultaneous translation tool which would help overcome all language barriers (rather than a common language as a supreme solution); for that very innovation he was decorated in 2010 by the Spanish Presidency of the EU – RETO2030). He was also one of the bearers/founders of the method of political anticipation, as this book masterfully demonstrates, notably in the part devoted to the necessary European foresight… keeping in mind he wrote that in 1992! Democrat to the end of his convictions, he denounced in this book the dysfunctions of the “community” system, the risks of aggravation and drifts (especially in the understanding of the principle of subsidiarity) and, therefore, of blockage within the implementation of the Maastricht Treaty; he would call once again – and this will be the battle of his life – all European partners (EU Member States, European Commission and Parliament) to be anchored to the European People for the European people, to tackle (in view of a monetary union) the process of European democratisation (in 1992, that was already a political anticipation on what would become the Euro zone). However, he also recognised the responsibility of the citizens concerning the road the Union would take. “Community or empire: up to the European citizen to decide!”. He would always repeat “Power should never be taken for granted, one must seize it. If the citizens want to have their say in Europe, they must organise themselves and force the European and national bureaucrats to share the European power. After Maastricht, the EU continued to follow the awful path of “treatocracy”, with Amsterdam (1997), then Nice (2001), and finally Lisbon (2009 – a miscarriage of what could have been the great rendezvous of the European institutions with the peoples), whilst “technocracy” came to support the agendas of economic and financial conquests, totally incompatible with the needs and aspirations of European citizens. This is precisely how empires are built, by breaking with the central power, the “unity” (here, in its acceptation of “uniformisation”), as a measuring instrument of success, which Franck Biancheri opposed to the “diversity”, an instrument for measuring European wealth, carried by the Maastricht’s creature called “Union”, as denounced here by Franck Biancheri; by bringing into the same mould some systems so different socially, economically as politically like for instance the Federal Germany, the Republican France, the very old English monarchical parliamentarianism, the young inexperienced democracies of the East, the northern pragmatic Europe, the bubbling Southern Europe … and above all, by imposing a distorted view of the principle of subsidiarity, as the last act of deviation from the communitarian “imperialist” system. It’s a community system which tried to “standardise” instead of “develop” denounced by Franck Biancheri after all. Today’s “community” environment has nothing to do with that of 1992 (to speak only of that one, for the entire world has been turned upside down), whether in the number of countries (from 12 member states in 1992 – meaning 45 years after the Treaty of Rome, to 28 in 20 more years), in enlargement of border areas, treaties, in number of citizens (about 300 million in 1992 and more than 510 million in 2016), modernised means of transportation, communication, internet … so why publish this text now? 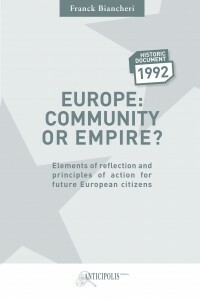 We can only note that the question “Where is Europe going?”, which Franck Biancheri asked in “Community or Empire”, and further on kept asking to thousands of Europeans during his marathon for European democracy throughout the EU in 2003-2004, despite notable changes in the structure of the EU and its governance (Schengen, Eurozone, EP capacities increase, etc. ), this question still needs an appropriate answer. After a period of systemic crisis which has swept the world, and from which the old West has struggled to rise whilst other powers have emerged, it is may be time for European citizens to get back to the work they stopped in 1992 and to finally finalise the creation of their community if they do not want to see their world disappear behind the walls which are being rebuilt around them; for that is also an empire: to build walls that mark the imperial borders. And it is undoubtedly up to European citizens to make a choice, as they are the engine of the “community” of Europe. Franck Biancheri does not only address the question of survival or of political change. In his acceptance, this question is also a matter of intellectual understanding (the words “Community”, “Europe”, “Union”, “Unity”, “Diversity”); of historical understanding (“Yugoslav war”, “Fall of the Iron Curtain”…); of internal functioning of the current all image system, of language abbreviations and signs, of the monolinguism imposed on us in Europe… destructive characters of all the philosophical nuances of words, but also the submission of our thought to the schematisation of a universal language (an incontestable sign of an imperial conquest killing diversity). A failure of individuals and minorities facing a centre and a bureaucracy aiming to control, to standardise and not to develop. A failure of the peace ideals also, because an empire is always providing platforms where conflicts and wars proliferate, a sine qua non condition for the maintenance of interior peace. Finally, the failure of a positive contribution to mankind, because an empire needs enemies, whilst a Community requires partners. If we chose to publish this unpublished text it is because these questions are still so bitterly actual. At a time when we are undergoing major political, institutional and political upheavals, 25 years after the choice of the “Union”, the inherent risks for the Maastricht Treaty defined by Franck Biancheri are currently getting ready to come out. For the last ten years or so, we have witnessed the implo-sion of the Union project inaugurated by the Maastricht Treaty. Re-reading Franck Biancheri’s anticipations helps to understand the springs of failure and to build the next Europe from the lessons learned and on a much better understood foundation.